Governor, 1836-41, the first in N.C. elected by popular vote; first president of Wilmington and Weldon Railroad. 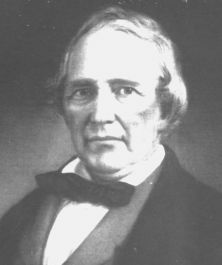 His home stands 2 blocks W.
Edward Bishop Dudley (1789-1855) was the first governor of North Carolina elected by the vote of the people. He was born on December 15, 1789, a few miles north of Jacksonville in Onslow County. His parents were Margaret and Christopher Dudley, a planter, merchant, and shipbuilder. By whatever method, young Edward received an education sufficient for a successful career in politics and business. 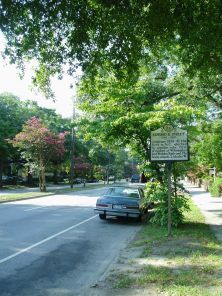 In 1815, he married Elizabeth Haywood of the prominent Raleigh family; six children were born of the union. After Elizabeth’s death, Dudley married Jane Cowan, widow of General James Cowan. In 1811 Dudley was elected to the first of two terms in the state House and in 1814 he returned as a state senator. During the War of 1812, he served as colonel of the Onslow militia that was sent to protect Wilmington against a threatened invasion. 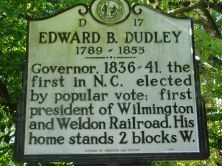 Shortly after the war Dudley moved to Wilmington and quickly rose to political prominence. He was elected as a borough representative to the legislature in 1816, 1817, and again in 1834 and 1835. Since one political party dominated North Carolina politics between 1815 and 1832, Dudley was designated a Republican, but he disagreed with national leadership. Elected to fill the seat in Congress vacated by the death of Gabriel Holmes in 1829, he found his views incompatible with those of President Andrew Jackson and his followers. Dismayed by the tactics of the president and the compromising nature of the Congress, Dudley refused to run for a second term. Dudley’s return home coincided with a groundswell in the movement to awaken North Carolina from its “Rip Van Winkle” slumber. He assumed a pivotal role in the formation of the Whig party that challenged the Democratic leadership by supporting constitutional reform, stronger banks, railroad construction and other internal improvements, and education. In 1836 he hosted in his Wilmington home the committee that organized the Wilmington and Raleigh Railroad. By 1835, the growing schism between residents of the western counties, who wanted fundamental changes in the nature and structure of state government, and those of the eastern counties, who wished to retain the status quo, had reached a critical point. A constitutional convention was called to work out the differences. The most notable change allowed the governor to be elected by popular vote, and the direct beneficiary was Edward Bishop Dudley. With the revival of the two-party system, Dudley became the choice of the Whigs in 1836 and defeated Richard Dobbs Spaight Jr. Two years later, he increased his margin of victory, defeating John Branch. Dudley’s administration initiated a period of progress. Perhaps most significant were internal improvements with the completion of the Wilmington and Raleigh and the Raleigh and Gaston railroads, and education with the beginnings of the public school system and the openings of three colleges: Davidson, Greensboro Female, and Union Institute (later Trinity College, then Duke University). After his tenure as the governor, Dudley returned to his position as president of the Wilmington and Raleigh Railroad. He retired to his home on the Cape Fear River where he died on October 30, 1855. He was buried in Oakdale Cemetery in Wilmington.